Something that goes along with your attorney’s style is the consequences of your attorney’s style. Some attorneys have bad reputations and people do not want to deal with them. Other attorneys have killed or almost killed deals for clients because they are difficult to work with or have a large ego. Ask other people you know in the industry if they know anything about the attorney, or even ask the attorney for references. If they are well respected, it will show. Next time, I’ll talk about fees. © 2010 Erin M. Jacobson, Esq. All Rights Reserved. 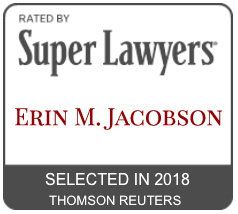 If you like this article and want to share it, you may provide a link to www.erinmjacobsonesq.com or a direct link to the post for others to read it. You may not reprint this article without written permission from Erin M. Jacobson, Esq. Another very important consideration in choosing an attorney is that attorney’s style. When you envision your attorney, what do you see? There are some attorneys that scream at everyone to get the job done. There are attorneys that would like to party with the band on the tour bus. Some attorneys are not that extreme, but are still friends with their clients. Other attorneys do not like to socialize with their clients and prefer to quietly sit in their offices. Some attorneys are in the middle of all of those types. Your attorney is part of your team and is a representation of your image in some cases. Think of how you want to do business and there will be the type of attorney for you. Next time, I’ll talk about the consequences of some of these attorney practice styles. I have already covered attorney personality and artists’ needs in choosing an attorney. Another thing to consider may be whether the attorney has similar clients to your musical genre. One way to help an artist find an attorney is for the artist to consider an attorney that might already have clients similar in style and genre to your music. If you are a hip-hop artist, you might want to go with an attorney that has other successful hip-hop clients. If you are a metal band, try to meet with an attorney who handles work for several other successful metal bands. This is not essential, but it is a good starting point for an artist who does not currently know any attorneys and wants to do some research on who he is interested in talking to further. Also, an attorney with clients in your particular genre may also have existing relationships with important people within that “world,” which will be beneficial to your career. Next time, I’ll talk about different attorney practice styles. Last week, I talked about the importance of an attorney’s personality. This week, I address another top concern in choosing an attorney — the artist’s needs. Attorneys do different things. Some litigate (sue people), some draft and negotiate contracts. Other attorneys “shop” or try to get clients a deal, while other attorneys have a strict “no shopping” policy. What do you need at this point in your career? What do you think you may need as your career grows? Think about these things and try to find an attorney whose services match your needs. Many attorneys do not shop, so it is wise to check the attorney’s website or ask the attorney for his/her shopping policy before requesting that the attorney shop you. Next time, I’ll talk about attorneys with a client base that fit your genre. In my last post, I covered the importance of hiring an entertainment attorney for your entertainment law needs. Now I will discuss how to choose the right attorney for YOU. Choosing an attorney is all about the right fit between the attorney and the client. There are a several aspects to consider in deciding what kind of attorney is right for you. I will review these various aspects in the next several weeks over a series of posts. Aside from being a skilled attorney, personality is the most important aspect in choosing an attorney. Do you actually like this person? Does (s)he explain things to you and counsel you on your career? Does (s)he consider your goals? Does (s)he listen to you? Do you feel comfortable with this person? Do you feel like you can trust this attorney? If the answers to all of these questions are yes, you may have found an attorney that is right for you. If you have answered no to one or more of these questions, you might want to keep looking. Next time I’ll explain how to tell if an attorney will meet your needs as an artist. Why Hire an Entertainment Lawyer? It is highly ill advised to enter into contracts without having an attorney review them. First, these contracts contain specific language that is quite foreign to someone not trained to interpret and understand it. Second, companies offering contracts to artists have had highly skilled lawyers draft these documents and often draft them in a way that is confusing, sneaky and intended to mislead the artist. I have encountered many artists, some of whom became my clients, who previously signed these types of deals without consulting an attorney. The result was that they got stuck into a bad deal, realized their mistake after they had already lost significant amounts of income and then needed someone to fix the situation – so they hired me. Having a non-entertainment attorney look over a contract is better than proceeding without an attorney, but it is still not an ideal scenario for an artist. This is because the entertainment industry has practices and uses terms in its contracts that only pertain to the entertainment industry. This field is so nuanced that even film contracts and music contracts differ in some of their terminology. An attorney that may be great at general business contracts will not be familiar with these industry-specific terms and will miss crucial points that separate a good deal from a bad one and could cost the artist a lot of money. I understand that legal services are expensive. However, it will be even more expensive to be stuck in or try to get out of a bad deal than had the artist hired an attorney to negotiate the deal correctly the first time. One option is contacting a free or low-cost legal service clinic, as there are some specific to the creative community. Another alternative is to have a consultation with an attorney. Some attorneys will charge a lesser rate for a thirty to sixty minute consultation that may answer a lot of your questions. A third alternative is to hire a newer lawyer that understands the business and can service the client at a lesser rate than an attorney that has been practicing for thirty years. I always want artists to be protected and get the best deal possible. Whomever you choose to hire, whether it be me or someone else, please make sure you get an entertainment attorney with experience in the type of deals in front of you. In an upcoming series of posts, I will discuss how to choose the right attorney for you.